Draft: 2007, Kansas City Royals, 1st rd. Is married.....wife's name is Stephanie.....the couple has a daughter, Mila, and a son, Michael ... Graduated from Chatsworth (CA) High School, where he earned National Player of the Year honors from several outlets, including Baseball America and Collegiate Baseball ... His uncle, Tom Robson, was a first baseman with Texas from 1974-75, and also coached with Texas, New York-NL, Cincinnati and the Chiba Lotte Marines (Japan) ... Helped raise money this past offseason for victims of the California wild fires and bar shooting in Thousand Oaks in November.....co-founded "California Strong," raising over $1.5 million ... Follow him on Twitter (@Moose_8). Batted .251 with 28 HR and 95 RBI in 152 games between Kansas City and Milwaukee ... Made 146 starts, all at third base (125g at 3B, 17g at DH, 4g at 1B) ... Set career highs in games (152), at-bats (573), RBI (95) and walks (49) ... Produced 20+ HR for the fourth time and 90+ RBI for the first time ... Batted .249 with 20 HR and 62 RBI in 98 games with Kansas City ... Made 96 starts with the Royals (75g at 3B, 17g at DH, 4g at 1B) ... Was traded to Milwaukee in exchange for OF Brett Phillips and RHP Jorge López on 7/27 ... Batted .256 with 8 HR and 33 RBI in 54 games with Milwaukee ... Made 50 starts with the Brewers, all at third base ... Batted .200 (8-for-40, 0hr, 3rbi) in 10 games during the postseason ... Won Game 1 of the NLDS vs. Colorado with a walk-off, 2-out, RBI-single off Adam Ottavino in the 10th inning ... Re-signed with Milwaukee through the 2019 season with a mutual option for 2020 on 2/19/19. Was named American League Comeback Player of the Year as he batted .272 with 38 HR and 85 RBI in 148 games with Kansas City ... Made 144 starts (127g at 3B, 17g at DH) ... Set career highs in runs (75), HR (38), slugging percentage (.521) and OPS (.835) ... His 38 HR broke the franchise record for a single season (Steve Balboni - 36 in 1985) ... Tied for fifth in the American League in HR (38) ... His 34 HR as a third baseman trailed only the Rockies' Nolan Arenado (37) ... Was an All-Star for the second time as he won the Final Vote by defeating Elvis Andrus (Tex), Xander Bogaerts (Bos), Didi Gregorius (NYY) and Logan Morrison (TB) ... Competed in the Home Run Derby and fell to Miguel Sanó (Min), 11-10, in the first round ... Belted his second career walk-off homer on 6/6 vs. Houston with a 2-run shot in the ninth inning off Ken Giles, giving the Royals a 9-7 win ... Smacked his 100th career home run on 6/20 vs. Boston, a solo shot off Chris Sale. Played in a career low 27 games, spending a majority of the season on the disabled list…placed on the 15- day D.L. on May 7 with a fractured right thumb, before returning on May 21…suffered an ACL tear in his right leg after colliding with Alex Gordon in Chicago on May 22, missing the remainder of the season...Collected 13 extra-base hits in 104 at bats for a .500 slugging percentage…averaged a home run once every 14.86 at bats, the fifth-best ratio in franchise history among players with at least 100 at bats...Batted .273 (24-for-88) with six doubles, seven homers and 11 RBI in April…among AL hitters, he tied for fourth in total bases (51), tied for sixth in extra-base hits (13) and was eighth in slugging percentage (.580) over the first month...Hit .313 (15-for-48) with four doubles, four homers and 10 RBI in 13 games at Kauffman Stadium…over the last two regular seasons, he's hit .290 (86-for-297) with a .502 slugging percentage at home...Recorded his third career game with three extra-base hits, collecting two doubles and a homer April 22 vs. Baltimore…set season highs in hits (three) and RBI (three)...Drove in the tying runs in the ninth inning on May 3 vs. Washington with a pinch-hit two-run single… became the first Royal to record a game-tying pinch hit in the ninth inning or later since Billy Butler (home run), on June 17, 2012 at St. Louis...Played in two games with Northwest Arkansas (AA) on a rehab assignment, going 2-for-8 with an RBI. Mike signed a two-year contract, avoiding arbitration, on February 11, 2016...Enjoyed an outstanding season, being selected to his first All-Star Game, becoming the first Royal to win the Final Fan Vote, being selected with 19.3 million votes...also named a co-Joe Burke Special Achievement Award winner by the Kansas City Chapter of the BBWAA...Set career highs in nearly every offensive category…batted .284 with 34 doubles, 22 homers, 73 runs scored and 82 RBI…also recorded career bests in on-base percentage (.348), slugging (.470) and OPS (.817)...He recorded 43 multi-hit games after collecting two hits or more in just 45 contests combined between 2013-14...Hit .297 with a .353 on-base percentage and 39 runs scored before the All-Star break…while he had a .522 slugging percentage and 51 RBI after the break, eighth most in the A.L...Hit an even .300 with runners in scoring position for the year, which included batting .358 (19-for-53) in those situations after August 1...Named the Majestic Royals Player of the Month twice (April, June), earning the honor for the first two times in his career…batted .356 (32-for-90) with six doubles, three homers and 19 runs scored in April…also hit .299 in June with five doubles, two homers and 15 RBI...Enjoyed another strong year vs. the Senior Circuit, hitting .315 (23-for-73) with four doubles, three homers and 11 RBI in Interleague games…he's a career .305 hitter with a .447 slugging percentage against the National League...Also hit .314 (32-for-102) with 10 doubles, a triple, seven homers and 32 RBI in 27 games against A.L. East foes...Set a Royals' franchise record with nine RBI on September 12 at Camden Yards…recorded his fourth career multi-homer game, which included his second grand slam…became the 11th player since 2000 to record at least nine RBI in a game, and second in 2015, joining Toronto's Edwin Encarnacion, who did it August 29 vs. Detroit...His two-run double plated the go-ahead runs in the ninth inning on August 23 at Fenway Park as KC rallied for an 8-6 victory after trailing by two runs with two outs in their final at-bat...Finished a homer short of the cycle on May 15 vs. the Yankees at Kauffman Stadium, collecting a single, two doubles and a triple, while scoring three runs…it marked his second four-hit game of the season, also recording three singles and a double at Cleveland on April 27...Started all 16 postseason games at third base…hit safely in his final six contests, including all five in the World Series...Batted .304 (7-for-23) with a walk and three RBI during the Fall Classic…this included two hits in each of the first two games of the series...Drove in the winning run in Game #4 of the World Series, singling home Lorenzo Cain in the eighth inning of KC's 5-3 triumph...Scored the go-ahead run in Game 2 of the ALCS vs. Toronto as KC rallied for five runs in the seventh inning...Blasted his sixth career postseason home run in Game 6 of the ALCS off Toronto's David Price…his six postseason round trippers rank second in franchise history, trailing only George Brett (10). Mike got off to a slow start and had trouble finding consistent success at the plate, hitting .212 with 21 doubles, a triple and 15 homers over 140 games...He was optioned to Triple-A Omaha on May 22, after opening the year hitting .152 (19-for-125)...He was recalled on June 1 and hit .284 (19-for-67) with a double, five homers and 14 RBI from June 10 through July 4...Blasted 15 home runs, which ranked seventh among A.L. third basemen...He hit 11 home runs between June 10 and August 25, which were tied for 10th most in the American League during that span...Hit 12 of his home runs against right-handed pitching...Collected a pair of doubles and drove in all three runs in KC's 3-2 win over Colorado on May 14...It marked the sixth time in his career that he's recorded multiple doubles in a game and first since September 17, 2013...Tallied four RBI at Arizona on August 6, recording a two-run homer as well as an RBI single and plated a run with a ground out...Ranked fourth among A.L. third basemen in zone rating (.786)...Also sixth in putouts (97) and fifth in assists (241)...Blasted a club record five home runs during postseason play, which also led all Major Leaguers during the postseason...Hit the go-ahead round-tripper in Game 1 of the ALDS in Anaheim, helping the Royals to a 3-2 win in 11 innings...Also blasted a 10th inning homer in Game 1 of the ALCS in Baltimore, extending the KC lead in an 8-6 triumph...Hit safely in each of his first six playoff games, including a 2-for-3 effort with a solo homer in Game 2 of the ALCS in Baltimore. Mike batted .233, which was fifth-lowest in the American League among players with at least 500 at bats... Hit .257 (82-for-319) after June 1, after hitting .183 (28-for-153) over the ?rst two months of the year...collected 23 of his 42 RBIs with two outs... Batted .301 (22-for-73) in August, his highest average in a month since hitting .315 in April, 2012... Hit .321 (17-for-53) with two doubles and a homer in 14 Interleague games... Matched a career high with four hits vs. Minnesota on August 5, his first four-hit game since September 23, 2011...also recorded his second multi-homer game with a pair of two-run shots at Target Field July 30... Blasted his first walk-off home run, beating Seattle 7-6 in 13 innings, on September 5...homered in three straight games, May 8-10... Played for Cardenales de Lara in the Venezuelan Winter League during the offseason, batting .288 (19-for-66) with six doubles and three homers in 17 games. Moose spent his first full season in the Majors...recorded 20 homers, becoming the first KC third baseman with 20+ since Dean Palmer connected for 26 as a 3B (34 overall) in 1998...Hit .268 with a .490 slugging pct. prior to the All-Star break and just .211 with a .325 slugging after the break...One of three Rawlings Gold Glove finalists, Moose was second in A.L. in fielding pct. (.967) among third basemen, first in assists (312, 39 more than nearest competitor), total chances (454) and zone rating (.841), and led all big league third baseman with 41 double plays, 10 more than second-place Miguel Cabrera of the Tigers...His 41 double plays is a Royals single-season record for a third baseman, breaking Mark Teahen's 2006 total of 34, and was the most in the Majors since 2010 (Evan Longoria, 46)...Recorded his first career 2-homer game on June 24 vs. St. Louis with a 2-run shot and a solo blast...Had a big night on July 2 at Toronto with an RBI double in the third and a grand slam, the first of his career, in the seventh...the 5 RBI were a career high. Mike opened the season at Omaha (AAA) before playing in 89 games for the Royals. ... After a slow start that saw him hit .182 with just 6 doubles, 1 home run and 11 RBI over his first 53 games through August 16, he batted .379 with 12 doubles, 4 home runs and 19 RBI in his final 36 contests ... his .379 average from August 17 to the end of the year was second in the Majors to Tiger Miguel Cabrera's .413 mark. ... Had his contract selected from Omaha on June 10 and made his MLB debut that night in Anaheim, singling against Ervin Santana for his first hit. ... Hit his first Major League home run off Joel Pineiro on June 11 at the Angels in his second career game ... then went 281 at bats before homering on September 13 vs. Minnesota ... hit 4 home runs in his final 13 games of the season. ... Hit in 15 straight games from August 17-September 1, batting .421 (24-for-57) ... the 15-game streak tied David DeJesus (twice in 2004) for the longest hit streak by a Royals rookie. Won the George Brett Award as the organization's top hitter after a banner season that he split between NWArkansas (AA) and Omaha (AAA)...tied for the minor league lead with 36 home runs and finished secondamong all minor leaguers with 124 RBI, tied for second with 77 extra-base hits, third with a .630 slugging pct.,tied for fourth with 305 total bases and seventh in OPS at .999 while playing just 118 games...Picked up several honors including the Sporting News Minor League Hitter of the Year, the MiLB Joe BaumannHome Run Award and the Texas League Player of the Year...Also was a fi nalist for the USA Today Minor League Player of the Year and Baseball America Minor LeaguePlayer of the Year...Despite playing the entire second half of the season in the Pacifi c Coast League, fi nished ranked fi fth in theTexas League in RBI and sixth in home runs...Had a magical night on August 30 for Omaha vs. Round Rock, hitting 3 home runs and a double, driving in 11and scoring 4 runs...hit a 2-run homer and a 3-run homer in the third inning...added a three-run double in thefourth and a three-run homer in the seventh...Follwing the season, was rated by Baseball America as the top prospect in the Texas League and the secondbestprospect in the Pacific Coast League...Was one of a record six Royals farmhands to represent Team USA at the Pan American Games QualifyingTournament...hit .244 with 3 doubles, 1 home run and 8 RBI as Team USA finished tied for third and qualifiedfor the 2011 Pan Am Games as well as the 2011 World Cup...Rated by MLB.com as the seventh-best prospect and ESPN.com as the 23rd-best in baseball entering 2011. Spent the entire year, his second full professional season, at Wilmington where he was named Player of theYear by the Royals...Finished third in the Carolina League in RBI, tied for fourth in doubles and tied for sixth in home runs...Played for the Surprise Rafters in the Arizona Fall League and was named to the 2009 AFL Top ProspectsTeam...also was a participant in the AFL Rising Stars Game...Ranked by MLB.com as baseball's 32nd-best prospect prior to the 2010 season. Spent the entire season with the Burlington Bees of the Class A Midwest League...hit .272 (135-for-496) in 126 games, with 25 doubles, three triples, 22 home runs, 71 RBIs, eight stolen bases and 77 runs scored...tied for second (Ryan Shealy) in home runs among all Royals Minor Leaguers and ranked third in RBIs...HR total led the MWL, and his .468 slugging percentage ranked fourth...hit .228 (59-for-259) before the All-Star break and .321 (76-for-237) after...had a hit in each of his first three games (April 3-5)...from May 4-14, hit in eight of 10 games with two hits each time...drove in a season-high four runs for the first time May 26 with a grand slam vs. Beloit...twice had RBIs in four straight games, June 15-21 (1, 2, 1, 2) and Aug. 1-5 (1, 2, 2, 4)...had more than one RBI in 19 games...went 2-for-4 with two homers, four RBIs and two runs scored Aug. 5 against Peoria...hit in a season-high six straight games four times, June 14-22, June 26-July 1, July 25-July 30 and Aug. 1-7. Made his professional debut and spent the entire season with the Idaho Falls Chukars of the (Rookie-level) Pioneer League...hit .293 (12-for-41) in 11 games, with four doubles, one triple, 10 RBIs and six runs scored...went 8-for-21 with five RBIs in his first five games...drove in a season-high four runs Sept. 5 at Casper. 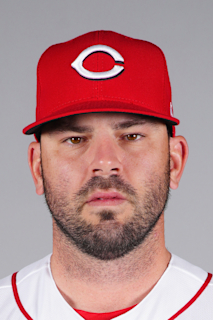 February 19, 2019 Milwaukee Brewers signed free agent 3B Mike Moustakas. October 30, 2018 3B Mike Moustakas elected free agency. July 28, 2018 Milwaukee Brewers activated 3B Mike Moustakas. March 10, 2018 Kansas City Royals signed 3B Mike Moustakas. November 2, 2017 3B Mike Moustakas elected free agency. November 4, 2016 Kansas City Royals activated 3B Mike Moustakas from the 60-day disabled list. June 14, 2016 Kansas City Royals transferred 3B Mike Moustakas from the 15-day disabled list to the 60-day disabled list. Torn right ACL. May 26, 2016 Kansas City Royals placed 3B Mike Moustakas on the 15-day disabled list retroactive to May 23, 2016. Torn right ACL. May 21, 2016 Kansas City Royals activated 3B Mike Moustakas from the 15-day disabled list. May 18, 2016 Kansas City Royals sent 3B Mike Moustakas on a rehab assignment to Northwest Arkansas Naturals. July 10, 2015 Kansas City Royals activated 3B Mike Moustakas from the bereavement list. July 6, 2015 Kansas City Royals placed 3B Mike Moustakas on the bereavement list. May 11, 2015 Kansas City Royals activated 3B Mike Moustakas from the bereavement list. May 8, 2015 Kansas City Royals placed 3B Mike Moustakas on the bereavement list. June 1, 2014 Kansas City Royals recalled 3B Mike Moustakas from Omaha Storm Chasers. May 22, 2014 Kansas City Royals optioned 3B Mike Moustakas to Omaha Storm Chasers. November 30, 2013 3B Mike Moustakas assigned to Cardenales de Lara. June 10, 2011 Kansas City Royals selected the contract of Mike Moustakas from Omaha Storm Chasers. January 3, 2011 Kansas City Royals invited non-roster 3B Mike Moustakas to spring training. July 14, 2010 Mike Moustakas assigned to Omaha Royals from Northwest Arkansas Naturals. July 12, 2010 Mike Moustakas roster status changed by Northwest Arkansas Naturals. July 8, 2010 Northwest Arkansas Naturals placed 3B Mike Moustakas on the reserve list. April 22, 2010 Northwest Arkansas Naturals activated 3B Mike Moustakas from the 7-day disabled list. April 5, 2010 3B Mike Moustakas assigned to Northwest Arkansas Naturals. January 18, 2010 Kansas City Royals invited non-roster 3B Mike Moustakas to spring training. December 1, 2009 Surprise Rafters placed 3B Mike Moustakas on the reserve list.